The Abyssinian cat breed is one of the oldest breeds of domesticated cats but little is known about its real origins. 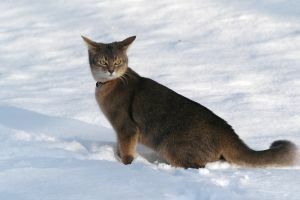 Some think that it is a descendant of the first cats of Egypt as the Abyssinian looks like the cats in Egyptian art and some believe that British soldiers brought a cat from Abyssinia (now known as Ethiopia) with them at the end of the Abyssinian war in 1868. An Abyssinian took third prize at the Crystal Palace cat show of 1871 and in 1889 the founder of the cat fancy, Harrison Weir, wrote a breed standard for the Abyssinian cat breed. This cat breed was further developed in Britain from 1896 and the first Abyssinian arrived in the USA in the early 1900’s. In the 1930’s the breed was even further developed and it became one of the favorite breeds of cat in the USA. The Abyssinian cat breed looks like a small mountain lion with an expressive face and a ticked coat that shimmers. These cats are athletic, very active and graceful. The Abyssinian is a short-haired cat with a coat that has a warm color produced by the Agouti ticking. This means that each shaft of hair has bands of alternating color. The coat comes in cinnamon, blue, ruddy, chocolate, lilac and fawn colors. The ticked pattern is a dominant tabby gene and the first color recognized in the breed was a brown tabby. The head is a modified wedge shape with large ears that arch forward. The Abyssinian’s eyes are large and can be gold, amber or green with a dark ring around it. 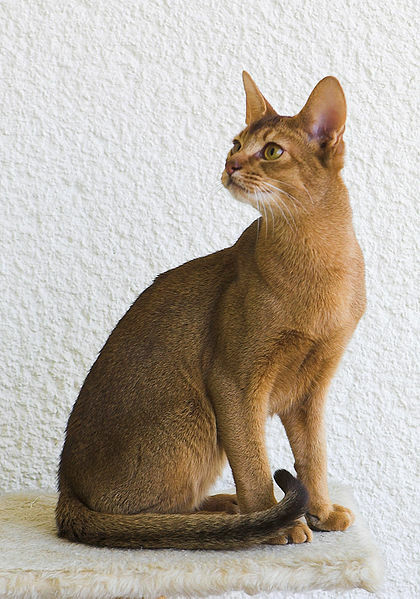 The Abyssinian is medium sized with a graceful and muscular body. They appear to stand on tiptoe, but that is due to the slim long legs with oval-shaped feet. A typical male Abyssinian weighs 8-10 pounds with the female weighing 6-7 pounds. The Somali cat breed is the semi-long-haired Abyssinian. 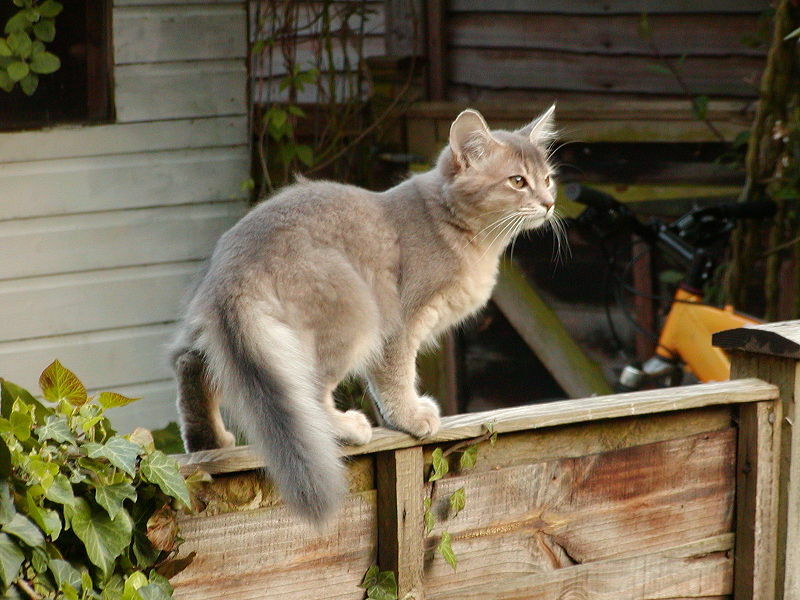 It has the same beautiful looks but with a shaggy ticked coat, ear tufts and a fox-like tail. Do not consider this cat breed to be a lap cat as they are extremely active and love to explore their surroundings. They like to sit up on a high perch to watch comings and goings and are very curious about what is going on. The Abyssinian is highly intelligent and likes to interact with its owners. They are a playful breed of cat that likes to play games that involve lots of jumping and running. The Abyssinian cat breed is low-maintenance, but there are some health issues that good breeders should be aware of and should be able to inform you about. A pyruvate kinase deficiency causing intermittent anaemia is carried as a recessive trait but there is a genetic test available for this. Patellar luxation or slipping kneecaps, retinal atrophy and renal amyloidosis (deposits in the kidneys) may also be found. Do you have a story about your Abyssinian cat that you would like other cat lovers to hear about?